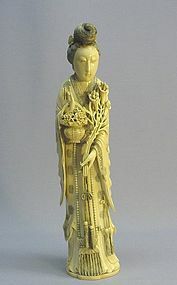 This finely carved noble lady is a mid or late 19th century product. It is 12” high, 2 ¾” wide and 2 3/8” thick. 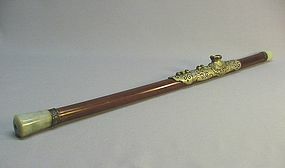 There is an honorable “Yong Zheng” mark on the bottom. The lady is holding a bunch of lily blossoms in her left hand and a basket of peony blossoms in her right hand. 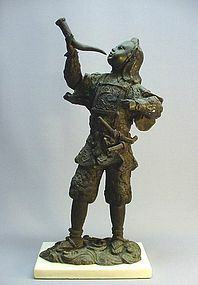 The statue has great patina. Aside from some loss of coloring and a small old repair to a broken tassel on the front of her robe, it is in excellent condition. 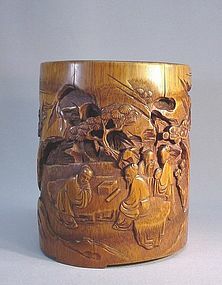 This carved bamboo brush holder (BiTong) is an early 20th century product. 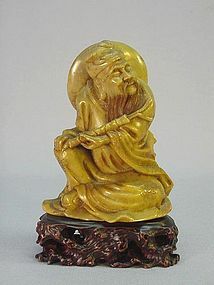 It depicts five sages and two young servants surrounded by pine trees and rocks. 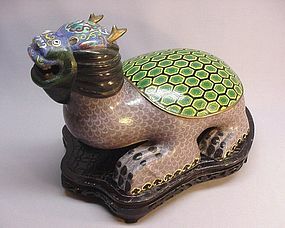 It is 6 ½” high and 5”~ 5 ½” in diameter. 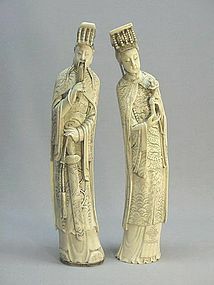 The carving is elegant and quite deep. 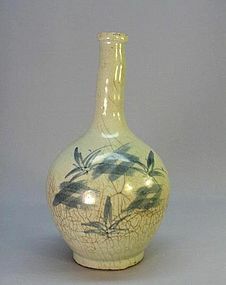 Aside from some cracks due to the age and nature of the bamboo, it is in excellent condition. 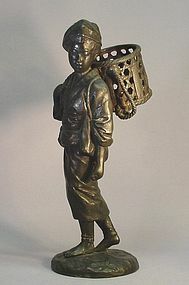 This cast metal figure of a farm girl is an early 20th century (late Meiji) product. 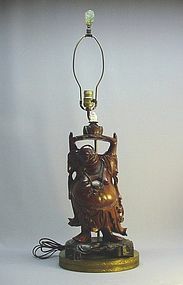 It depicts a bare footed farm girl carrying a large basket on her shoulder. It is 11 ¼” high and 4 1/8” in diameter at the base. The tip of the small stick she holds in her left hand is broken off. Aside from this, it is in very good condition. 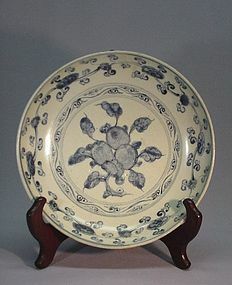 This Chinese early 19th century blue and white plate is 8” in diameter and 2” high. 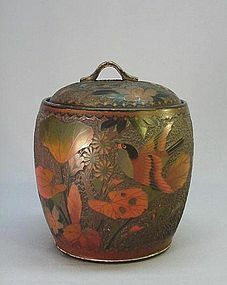 It depicts a fruit with leaves in the center; a floral design covers the side and the back. Aside from some blemishes due to the firing and three small chips on the back rim, it is in fairly good condition. 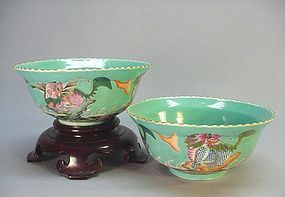 These rare early 19th century ceramic bowls are 2 ½” high and 6” in diameter. 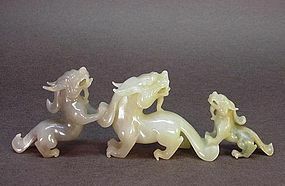 They depict four mythical sea creatures resting on rocks surrounded by ocean waves. The background and inside are turquoise blue. 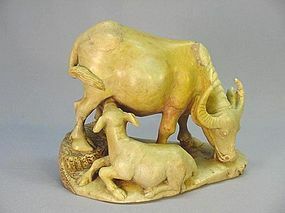 There are red “Dao Guang” (1821~1850) marks on the bottoms. Some gold edging has rubbed off from the ribbed rims. Aside from this, they are in excellent condition. 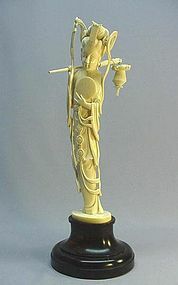 This very well carved ivory beauty is an early 20th century product. It depicts a young lady holding a round fan in her left hand and carrying a flower basket on her right shoulder. 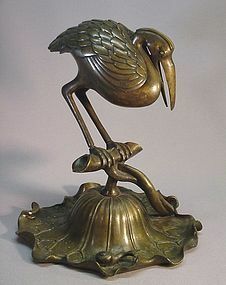 It is 12 ¾” high (with wood base, it is 16” high), 2 ½” wide from her shoulders and 2” thick. 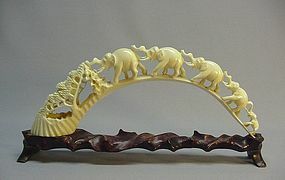 Aside from one small age crack line on the base of the ivory, it is in excellent condition.